Location Advice - California Businesses: New Industrial Buildings - Why not More of Them? Industrial buildings - where folks make, store, stage, service, and ship things - have been the darling of investors and developers for almost ten years. Given the simplicity of design and the flexibility of uses - these large concrete boxes rise out of the ground akin to those card houses you erected as a kid. Demand from occupants has been robust as every new development in Orange County has been consumed - many before the completion of construction. So with these realities as a backdrop - investor interest, simplicity, demand - why don’t we see more new development in the OC? The short answer? It’s risky! For a longer review - I posed the question to Gary Edwards and Jeremy Mape of Western Realco. What follows is their take on why. By way of background, Western Realco has developed over 3,000,000 square feet of industrial buildings since 2010. Most notably - the former Beckman site in Fullerton, Neville Chemical site in Anaheim, vacant land formerly owned by Harte Hanks and Suzuki in Brea, and a couple of shuttered data centers - they’ve been active! Site scarcity. In order for new development to occur, a vacant site is needed. Vacant land sites in our county are rarer than a blood moon - so, developers are forced to re-purpose obsolete manufacturing plants - such as the ITT site in Santa Ana or the former Boeing campus in Anaheim. Because the operations housed on the parcels commenced in an earlier regulatory era - simply demolishing the old structures can be complex. Environmental concerns such as asbestos, methane gas, underground fuel storage - or worse - can be encountered. Someone must pay to clean up the mess before new buildings appear. Fewer and fewer of these opportunities exist. Plus the remaining ones are costlier - partially because many developers have opted to scrape aging plants in favor of multi-family projects. Processing time. The old adage “time is money” certainly applies here! Frequently, cities have a different vision for a project than the builder. Time is required to sync the expectations. “Short staffed” typically describes the city workforce tasked with reviewing conceptual drawings, offering commentary, making changes, preparing staff reports, and approving the development. Occasionally, residents will weigh in with their concerns about increased truck traffic, noise, and disruption. All of these issues must be carefully anticipated, massaged and resolved - without breaking the bank. Generally, a land owner will want his money before a final plan is approved and permits can be issued. Therefore, a huge uncertainty is born by the builder - if something unexpected arises - he’s stuck. Rising construction costs. Site scarcity described above means you pay more. Materials including concrete, steel, drywall, roofing paper, and paint have all seen a bump in price - especially if the products are petroleum based. Contractors are busy. They can charge more for their contribution. The modern industrial occupant demands more goodies be contained in the new construction. That extra 4-8 feet of building height requires more concrete and engineering calcs. A beefed up warehouse fire system needs bigger pipes and stronger water pressure. 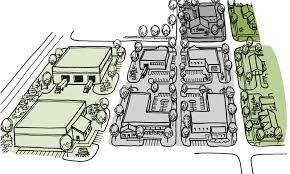 Concrete vs asphalt parking lots? Yep. Costlier. Rents haven’t kept pace. Site, processing, and construction - the three pillars of a project’s expenses - create a cost model from which a return is derived. The return is formed by the rents a resident pays for the facility. In the 1980s - for instance - a 10% return on costs - after a preferred return was paid - was the norm. Nowadays the expected return is around 5-5.5%! You may be thinking - where do I get a 5.5% return? That sounds great! Just remember a lot of risk is associated with the return. One surprise - boom! Bye bye return. Net effect? Rents have now eclipsed $1.00 per square foot - vs $.55 per square foot nine years ago. However - they’ve not kept up with the increased costs - despite a lower return expectation.